How has worrying about what other people think interfered with your life? What has it stopped you from doing? How have you coped? Leave a comment below and share your insights with us. Thank you so much for this timely post. I have been getting better and better understanding that we never need to carry more than we can hold…we just need to take it one day at a time. I always put myself under pressure of what others think of me. It has stopped me on many occasions from following my heart. But your words here (and in your book) are pushing me forward in the right direction. Honestly, the reminders you’ve been giving me have been keeping my head straight. This post penetrated my whole being. Having struggled with insecurity for most of my life, I pretended to be someone else just to be likable. I was afraid of my boss thinking I was lazy, so I brought home my work and spent my weekends working instead of spending quality time with my family. My fear of being seen as stupid led me to triple and quadruple-check everything before I make a decision. All these focus on what others think led me to miss out on life. I stopped pursuing the things I love because I was too busy pleasing everyone else. I sacrificed my time just so others will not think ill of me. The turnaround came when I started to suffer physically. Even though I exercise a lot and do a lot of meditation and yoga, the sheer stress I imposed on my body was too much. I started to get sick more often and I was becoming irritable. I decided then to get some help, read books and devour blogs like Marc and Angel. I’m slowly making progress. Thank you for these incredibly helpful posts! On the other hand, I can think of so many situations in which I did something purely driven out of spite for his foul judgments. For example, he told me I wouldn’t get into the grad program I wanted, so I applied and got in just to throw it in his face. When I told him the news, all he said was, “Good job” which in turn, antagonized the overall pursuit. I am done making choices on behalf of the off chance that I might earn approval; because in the end, I need to earn my own stamp of approval or all my efforts would have been wasted. Like Susan and Nila, this is something your newsletters, book and blog posts have been helping me with, gradually. Yes, if the people close to you are happy with you then who cares what everyone else thinks. There will always be people who don’t like you. If you think that you are a good person that is what counts. Thank you for posting this! I always have concerns about what people thought about me just after what I had done. Even worse when someone tells others about it. Will they think of me as stupid or idiotic? I got so insecure as well as losing trust in others. Just recently I realized I have some friends who had to go through this. And sadly, I have this one friend who actually asked me what I thought of her. I really like point No. 1. We usually overestimate that amount of attention we occupy in other people’s minds! Great article but I definitely have to add some perspective to the first point. From my own experience I have had people who watched me very closely and were suspicious of my every move once I had had some major success in my life. Most people who never believed in me were astounded and threatened by my ability so they watched me like a hawk and tried to make my life hell. So sometimes, especially when people around you are playing political games with you, you have to care what people think and keep a sharp eye on them. Sometimes people can be malicious in ways you wouldn’t imagine whenever they feel insecure and threatened. Believe me. Thank you for the reminder that I am enough. I am doing the best I can. I will survive & flourish. A good rule of thumb to keep is: If you are going to do something just to impress people, don’t do it and if you are afraid to do something because of what others might think, do it anyway. I like your thumb rule Ray. I just love the way you guys write. Thank to you am becoming a better person and overcoming a personal loss. I always look forward to an email from you. No matter how bad am feeling or how bad my day is knowing I will get mail from you guys just brightens my day. Thanks a lot. Your emails reinforce the changes I’ve made since my life totally turned into a different direction when my husband of decades decided he wanted a divorce. My faith in Jesus Christ sustained me, but I find so interesting that the very things I chose to do I’m reading in your emails. After he filed, I chose to see this surprising break up as another adventure in my life and to be determined to grow in it. I found so much healing in reaching out to other hurting people as I was called to go by Red Cross, as disaster nurse, to national and local disasters. As I did my value of others and myself changed. My compassion grew and my caring how others viewed me diminished. I was FREE TO BE ME!! Thank you for helping me continue to go forward. Worrying about what other people think has caused anxiety and fear in my life. It has also prevented me from reaching my full potential. I acknowledge where it stems from, but overcoming it had been a process. I really love your website and the book. I ordered one for myself and one for a co-worker. I really don’t mind you sharing my story because it’s freeing. I wasted pretty much a whole decade of my life worrying about what other people thought. I knew something was majorly wrong with me, but refused to get medical help (bi-polar disorder and low testosterone). So I suffered in silence for 20 years. I refused to date anyone because I was so afraid that when they discovered all my problems they would reject me outright. I made very sure that no one knew about anything. And now I have no idea how many opportunities, choices and decisions were made out of total fear, and how much I lost in the process. Almost no day goes by without me thinking about what might have been. Only in the past 18 months have I even told a few people about my situation in full. What a waste of a good life. I believe “worrying what people think” can also stem from constant criticism in One’s childhood from a parent and/or siblings. When one grows up being criticized and looked upon negatively their self worth takes a tumble from that alone..However, I’ve learned most go through life trying to please and look for constant reinforcement. Its a vicious cycle. I was born a people pleaser…I lived to gain good opinion.Now having lived through an unhappy childhood,a train wreck of a marriage,all due never having learnt to say no,I am an old man with an attitude.Thank you for the wisdom of your teachings ….they are a real comfort,and I look forward to them I wish they had been around years ago and saved a wasted life…. Marc and angel, thank you for everything you do. U GUYS ARE DOING REMARKABLE WORK! This is a wonderful lesson for most of us. I spent many nights and days worrying about what people thought of me. I finally decided that I didn’t care and maybe just maybe they didn’t even know me. I turn out to be right. All my insecurities were causing me to believe things that didn’t exist. I also learned that people many times are using their perception of themselves to just others. They have a problem not me. I am too busy now living my life. Thanks for another great post. Well said Maureen. I totally agree, also control freaks and insecure people are the worst, i can only stop playing their mind games for so long, the nasty comments they dish out at you and i am always off guard, i tell myself they are not my friends and i pity them, what a sad life they lead, eh? That’s why this is so good to read… great reminder, this kind of stuff will never stop, it’s how i deal with it, and that’s a whole new story….. This was a much needed read. I have struggled with this since I was young and it has stopped me from doing many things over the years. Currently I am trying to get past a breakup and the words read in this post and a few others are helping me break past the clouds I have allowed to overshadow many of my days as of late. I know I will have to read this a few times before it sinks in but I am thankful I have it to read at all. I wanted to share a story too. We are often told to “Do unto others as you would have them do unto you.” Wrongly we expect that they will do to us, what we think they suppose to do to us. We don’t have to worry how they will accept our behavior. We should do the best we can in every situation, because if we do less, it is us who have to live with that. But don’t worry too much about it either. Sometime is the best we can just take a rest and leave the urgent matter to wait. I don’t know how I can express all my gratitude for this text having arrived today (yesterday, actually). My Monday was a bad day because I just fought, just thinking and remembering exactly the unfair and negative words and opinions of people incredibly even know me right. In addition, I had problems with relatives who never supported me and always have belittled my efforts. I am a writer and graduated in History, but I come from a family that never supported me (even when I was sick severely); or, at least, didn’t give me a chance to grow as a person. Today, all this weight made me stop. I couldn’t do anything because I thought everyone was right and I was useless. So, anyway, I decided to open my email and I couldn’t believe it when I saw the title. I know it’s pretentious to say this but, it was like the answer to my doubts and anxieties right there, in my email box. Thank you, Marc and Angel all support their words give. Was a watershed the words of this text in my life tonight. And I’ll get to make these changes and no longer allow the opinions of others bound for my life. A hug for you two! All my life I have looked for one or the other person to be my approver and this has led to massive complications and no one else but the real me suffers in all this. I am almost a middle aged woman now, however I have been emotionally limp most of my life. However the good news is that change has finally crept in.I am taking baby steps to brush off what others have to say or think about me because inside of me I know, I am not what they say I am. These five points have further helped me in that struggle. Thanks!! I’ve been struggling with harsh self-judgement for quite some time, so (needless to say) I was very happy when I saw this post! Thank you! Excellent advice. I also recommend reading The Four Agreements . I’ve always listened to what other people thought of me and let it get me down. I tried to prove them wrong and be perfect in every way. It’s even led to me getting bitter about certain things. I had cancer twice and my brother called me a hypochondriac. I even let that bother me. I’m dealing with my father’s declining health and I worry about the decisions I make will be criticized. I get mad at people who don’t understand what I’m going through. It finally came to a head yesterday when I thought I was going to lose my mind. I’ve been able to talk with someone who finally gets me. She put it in my head to stand up for me now and do what I need to do for myself immediately to save myself. I feel better already, but I still have work to do. It might not sound like the best way to deal with things right now, but I need to take myself out of this un supportive environment and recharge my battery so to speak. I am really glad to hear that you have been able to make positive changes in your life. And, I just wanted to say that I really respect you, whenever I am just scanning through the comments, (yeah… I don’t always read all of them) and I see ‘David Rapp’ on the comments I make sure to read that post because what you say always seems really wise and always seems to take a completely different and interesting approach on the topic at hand. The main reason I am writing this post is because honestly it’s kind of sad to hear you express your life as wasted. I think what is important is that you are not settling for where you are and are continuing to strive to make positive change throughout your life. Just remind yourself that while your old life may be dead and gone, it’s for the best because your new life is just beginning, and it’s going to be beautiful. Such a timely email..amazing that when you are ready the lesson arrives!!! For years the only person whose approval I sought was my partner’s….but I have learnt over time that he feels threatened by any success of mine and will actively “talk it down”. Today we checked into a hotel and the girl at the front desk complimented me on my hair (naturally curly)…normally I wouldn’t carry on a conversation because I would worry about his criticism…tonight I chose to have that conversation across the hotel lobby with her……my attitude was different…he didn’t say anything critical…..whe you make the decision to be yourself and not seek others approval it will show!!! Thanks again for great lessons!! This is a wonderful post and a timeless lesson that’s quite easy to forget. I think we have this “crowd” in our head that we want to belong to. They’re not necessarily like us, but they’re a cool crowd. And perhaps similar to the “looking-glass self”, we are governed by how we assume or expect they see us. So we try to fit in. This could be really tiring. A lot of energy and time easily down the drain. Since I shifted from being the “Hey! Please like me!” type of guy to my true self (who I thought was you know, boring), I noticed I could engage people more–interaction became better–because I am my true self. They may like me or not, but I learned it wasn’t really my problem. At the end of the day, I’m at peace with myself, which is all that matters. Wow, amazing! I love this post. @Maureen: No doubt about it. That’s why it’s so important to instill the right values in our children. I am glad to have read this article. Actually,I am not confident… so I always try to act well in order to receive good praise. However, the truth proves that it is foolish. Now, I realize that we should live for ourselves too. Trust yourself including your styles, your opinions, etc. Only when you accept yourself can others believe you. Over the years i have gone through times when my character was tested – times when you suddenly hear your name being mentioned in a conversation or moments when people react as you pass by. I can say for sure that it was tough, something I have always pondered upon every night asking myself what have I done wrong to them to deserve that kind of treatment. Perhaps as time went by,after nights of thinking and reflecting I have made a decision, a decision to stop thinking about what others think about me and do not let myself drown from other people’s criticism even if they don’t know me,from then on I would always remind myself that I should always be who I am at all times because it is there when you get to meet the genuine ones who truly appreciates you for who you are. Worrying has become a bad habit to me to the point where I do not listen to my relationship and work. One reason I worry is to generate advice, consolation, or drop some love in a timely manner (statuses for work). I worry to the point where I worry if I am not worrying sometimes. This worry is usually approval from others. I worry about what they think about my choices, my intelligence, how I spend my time, and so many things. I realize that I may have lost my girlfriend recently after I worried about how I was going to help her amidst her problems. I wasn’t living in the present. I wasn’t telling myself simple thoughts to myself such as “being there for her could be enough” or simply saying “I am enough; just be there for her.” Enough good for everything I aspire to do and be with. What has helped me recently is to slow up, pray/thank, and write. I am used to trying to move fast and would dislike writing (which would help me in my teens) because it would make me feel slow and external expectations demand me to move fast. Now, I just accept and write for my life. I hope I didn’t lose her. Thank you for your time and energy of such wonderful reminders. 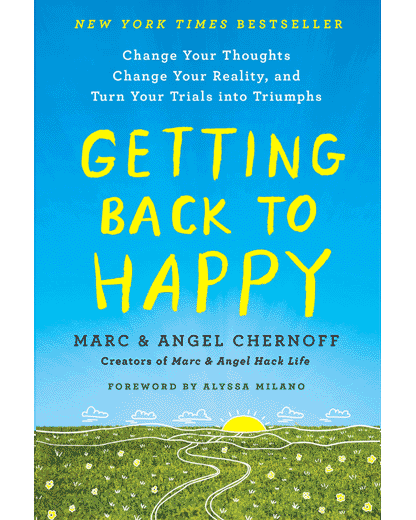 Mr. Marc Chernoff, Wow! Are you sure you haven’t been in my wife’s head? You have summed up just about everything my wonderful wife has been telling me since the day we met (19 years ago). Her wisdom (not what she learned at school) has saved me from myself many times. I have suffered from many bouts of ‘end of the world’ thinking and of caring too much about what I think that others might be thinking of me. It has crippled me at times but I have always had an angel by my side to talk some sense into me. Reading this article has been almost mind blowing. I had to share it with my wife. I read it out loud to her. Even she was blown away to realize that there is someone else who thinks like her. It even brought tears to her eyes because almost every thought you have written in this post was familiar to her. Your words are almost exactly the words that she has been trying to permeate through my thick skull like a constant song over the years and while I have grown a lot wiser in understanding that people aren’t really thinking of or about me, since they are mostly thinking about themselves most of the time, I still have a tendency to care too much about what others might think of me and choose my words and actions carefully. I am bookmarking this post so I can come back to it any time so I can read the lyrics of her song which you have so eloquently put together. Nice post! I reviewed myself while reading this post. I find myself not doing things at work because I’m so afraid of doing them wrong and, because of that, afraid of what people will think of me . I rather prefer being unemployed so people don’t see what I’m doing. I’m so scared of being stuck forever because of that. Plus, I kind of hide myself from my boyfriend (I think he doesn’t really knows my true self, my fears, my tastes) because I just don’t want him to make fun of me, or think I’m not good or interesting enough. I will think about what you wrote, it might help me. Thank you. This resonates with me SO much– I feel like you have described my existence! I have been a teacher for nine years, and year after year I find myself caring more about pleasing others (other teachers, parents, and administration) than about my own personal growth. This has kept me from doing so many amazing things, and from making waves in school and community when I should have. Unfortunately, politics get in the way of progress in the workplace, and some of us shoulder the blame more than others. The playing field is not and has never been equal, so the best we can do is be genuine and hope that is enough. Sometimes we just have to disregard others’ opinions, because that’s the only way to stay healthy! Somewhere the universe knew I needed this message very urgently today when I am at a very low point. I recently accepted an invitation to teach on a short 8 session course in a subject closely related to my field of teaching but with a different content and a very different methodology. I put in all my sincerest hard work, asked people with expertise for guidance and did my best in my teaching. I knew it was not my best performance as it was all new to me, but I enjoyed teaching the course and learnt so much from it. Though the students seemed happy, I expected an average feedback, nothing great, nothing bad. But then I got an immense shock yesterday when I saw the very negative feedback that the students had given me. I am devastated and have been doing an incessant post mortem of what I did wrong and panicking about what the people who invited me to teach must think of me, in short ‘an end of the world scenario’, till a friend pointed out that the feedback was given 10 minutes after the students got their grades. I am so upset that I have completely forgotten that the feedback that I get in my regular teaching job has always been very positive. I have always had problems with self-esteem and I must confess almost obsessed with getting people’s approval for everything I do. Many a time, I have not bought something just because I sense that my friend does not approve of it! How pathetic this looks to me as I articulate it. Your message has come at such a timely moment awakening me to the horrifying extent to which I depend upon others’ approval for everything and how much work I need to do on my self esteem. The moment I started reading your article, I knew that a kind and merciful universe had sent it to me to see things clearly. Thank you so much Marc and Angel for your words of truth. Thank you to all the people who have shared your stories laying bare your fears and anxieties and making me realize that I am not alone in this. Thinking about what people think or say about you is frustrating and relenting all you do is speak to yourself and encourage yourself not to get blast of by the wind of critics and discouragement. Wow, these words couldn’t have come at a better time! I let people and what I perceive to be their rejection of me, to leave a good job I had. A friend always told me “You know that no one is looking at you” when that’s what I always thought. I thought people were looking at how unattractive I am, how quiet I am. So the first point- Remind yourself that most people are not thinking about you- really resonates with me. The whole entire article resonates with me. One of the commenters pointed out that when you’ve grown up with a lot of criticism and negativity, it becomes second nature to seek out approval. Mine is on steroids! So thank you, thank you for this article that is the best I’ve seen on this subject.